A cough combined with nasal congestion is, simply put, annoying. These symptoms often accompany the common cold, but they also occur with allergies. An alternative to sugary cough syrups, one can use essential oils like lemon, frankincense, lavender, etc, as a vapor rub or as a cough syrup. A holistic-minded medicine cabinet may be the place to go to for cough and cold relief. Aromatic oils and plants have been used for thousands of years in medicine and religion. Various ancient cultures have used essential oils, including Egypt, India, China, and Southern Europe. Aromatic, or essential, oils can be found in various parts of a plant including the root, leaves, flowers, bark, wood, seeds, resin, and balsam. Essential oils are also called volatile oils or ethereal oils. These oils provide the “essence” of the plant’s fragrance, as well as a specific flavor. For example, the essential oil of a lemon or an orange is not difficult to identify—we can easily recognize the citrus scent. Colds, allergies, and other respiratory conditions can be quite the nuisance. While colds are most common during fall and winter, environmental allergies are most often seen in spring and summer. The result in either case is often a hacking cough, congestion, sneezing, a sore throat, and a general feeling of fatigue. Luckily, there are essential oils for a dry cough that provide relief. Research shows that lemon essential oil can boost the immune system and inhibit the growth of bacteria. Lemon oil is one of the most effective essential oils for cough and congestion. It’s made from lemon skin, and is used for sore throats due to its anti-inflammatory, antioxidant, and antibacterial properties. Scientific evidence shows that lemon essential oil can boost the immune system and inhibit the growth of bacteria. 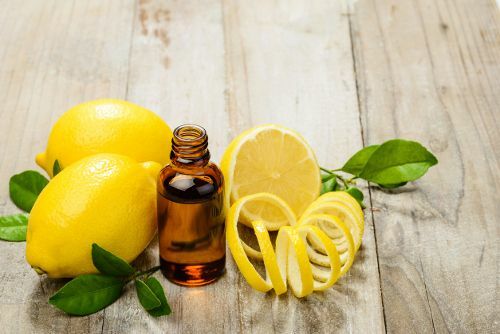 In a study published in the Journal of Antimicrobial Chemotherapy in 2001 (1), the antibacterial action of lemon oil was found to be effective against cold and allergy symptoms. Pure frankincense. Frankincense oil is a great anti-inflammatory for clearing the lungs and nasal passages, and regulating breathing patterns. 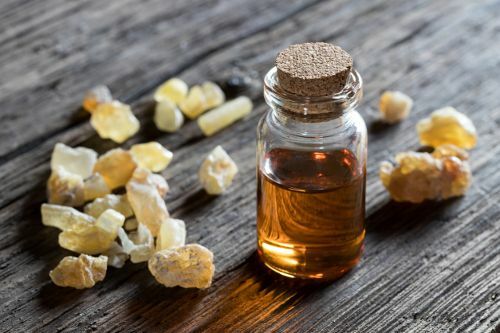 Frankincense oil is one of the most powerful oils around. In fact, at one point frankincense was valued even more than gold. Today, frankincense oil is a great anti-inflammatory for clearing the lungs and nasal passages, and regulating breathing patterns. In particular, it can help eliminate phlegm in the lungs. In the treatment of coughs or colds, use two to three drops of frankincense oil in your diffuser. Lavender is especially useful for respiratory disorders and symptoms such as colds, influenza, coughs, and sinus congestion. 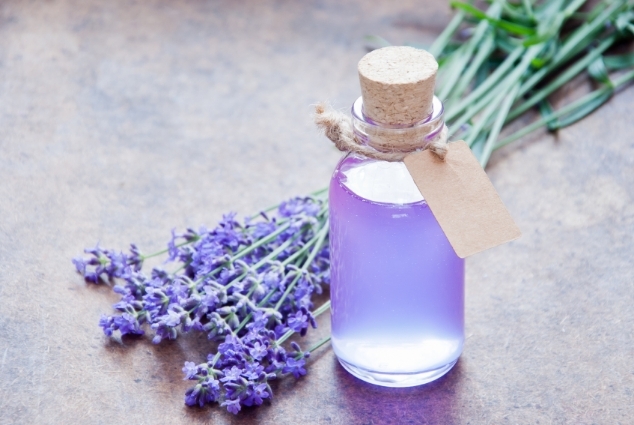 Lavender is one of the most common essential oils available. It’s especially useful for respiratory disorders and symptoms such as colds, influenza, coughs, and sinus congestion; it can ease breathing problems when phlegm is trapped within the sinuses and lungs. Apply a few drops of lavender oil on the back, neck, or chest for relief. Studies suggest that the antispasmodic activity in peppermint oil helps relieve coughing. Peppermint is an essential oil best known for its antiseptic, antiviral, antibacterial, anti-inflammatory, antimicrobial, antispasmodic, and expectorant properties. Peppermint is a common treatment for sinus infections, respiratory infections, coughs, colds, and sore throats. A study published in the Journal of Ethnopharmacology in 2010 (2) suggests that the antispasmodic activity in peppermint oil helps relieve coughing. The menthol in peppermint oil is thought to calm and soothe sore throats, while also relieving coughs by thinning mucus. Thieves oil is best used as a throat spray to help treat coughs or sore throats. Thieves oil is an essential oil blend that combines lemon, cinnamon bark, eucalyptus, clove, and rosemary. Legend has it that this essential oil blend was created by thieves during a great plague. The thieves were protected from the plague by rubbing themselves all over with the oil blend before invading the homes of plague victims. This blend is known for its antibacterial, antiseptic, and antiviral properties, and is best used as a throat spray to help treat coughs or sore throats. 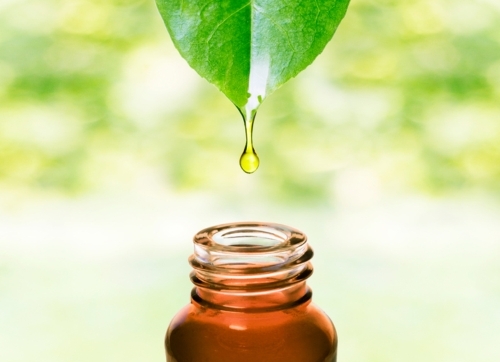 Tea tree oil contains antimicrobial, antiseptic, and antiviral properties. It’s a great essential oil for bronchial congestion. Tea tree oil has been found to exhibit protective activity against bacteria, fungi, and yeast, according to a 2000 study from a German research team (3). These microbes can cause inflammation, which depletes the immune system and leads to symptoms including coughs and congestion. Fortunately, tea tree oil contains antimicrobial, antiseptic, and antiviral properties. It’s a great essential oil for sore throats, coughs, and bronchial congestion. For relief, simply apply 10 to 15 drops of tea tree oil as a cough remedy on your neck and sinuses. 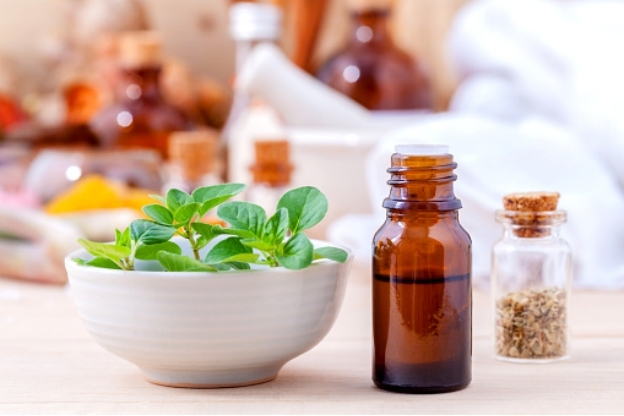 Oregano oil contains the antimicrobial active ingredients carvacrol and thymol. Oregano oil is powerful antiviral essential oil. 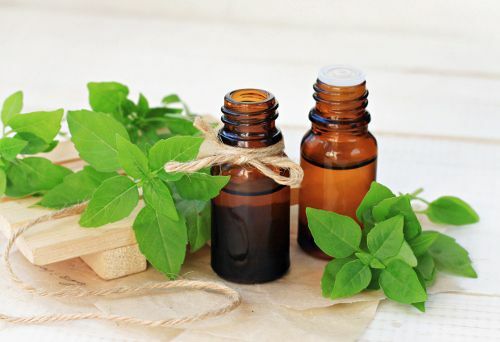 A prospective randomized double-blind and controlled study published in the journal Evidence-Based Complementary and Alternative Medicine in 2010 (4) found that a spray containing essential oils such as oregano oil, rosemary, peppermint, and eucalyptus resulted in significant and immediate symptom relief from upper respiratory ailments including coughs and sore throats. Oregano oil contains the antimicrobial active ingredients carvacrol and thymol (5); it’s the carvacrol that is thought give oregano oil its potency. 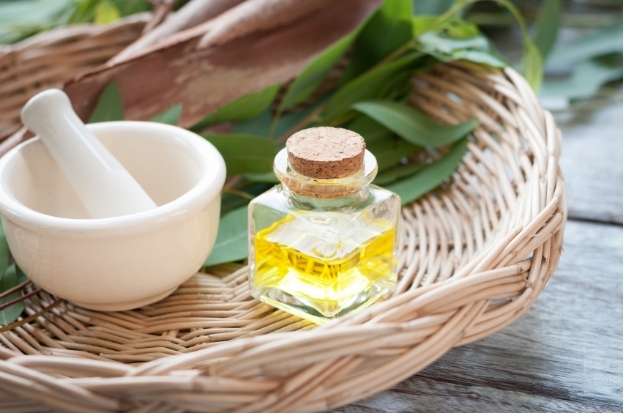 Eucalyptus oil is useful in the treatment of congestion and upper respiratory infections. Eucalyptus oil is known to reduce respiratory inflammation (6), and loosen mucus in the lungs. But the use of eucalyptus is not just limited to natural remedies—it’s found in many over-the-counter products for cold, cough, and congestion relief. Eucalyptus oil’s health benefits are due to its abilities to improve respiratory circulation, provide antioxidant protection, and stimulate the immune system. 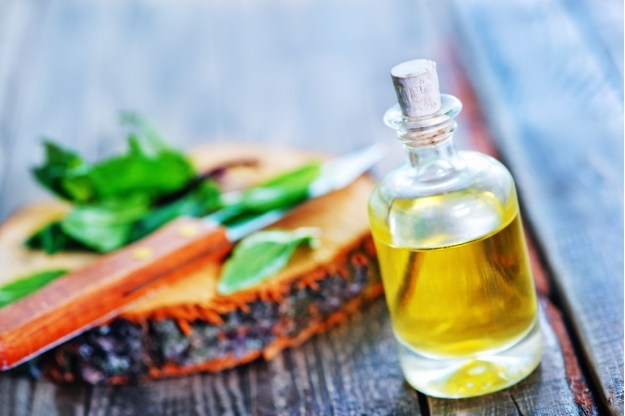 The active ingredient in eucalyptus oil is called cineole, and studies have long indicated that eucalyptus oil is useful in the treatment of congestion and upper respiratory infections. Research shows that thyme oil can help support the immune and respiratory systems. Thyme oil is one of the better essential oils for coughs and congestion due to its antioxidant, antibacterial, and antimicrobial properties. These effects can help support the immune and respiratory systems. 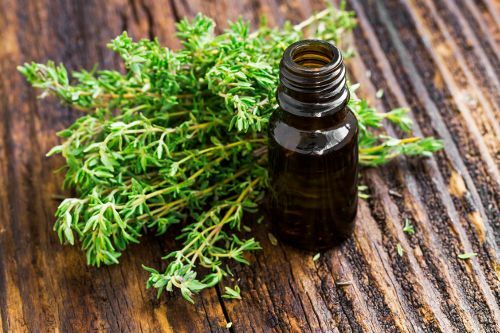 In a study published in the journal Medicinal Chemistry in 2011 (7), researchers examined thyme oil’s response to 120 strains of bacteria that were isolated from patients with respiratory infections. The results found that thyme oil exhibited strong activity against all the bacteria strains, which means that thyme oil is perfect for sore throats, coughs, and congestion due to colds. 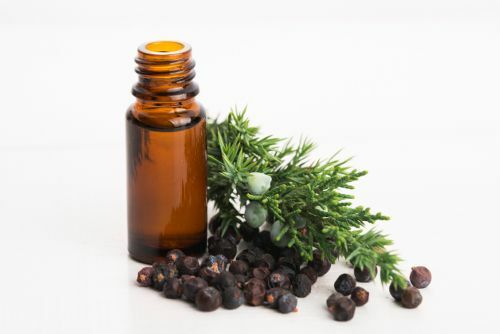 Juniper berry essential oil contains more than 87 active ingredients including antifungal, antioxidant, antibacterial, and antimicrobial agents. Juniper berry is an essential oil with a woodsy and sweet smell, and is found in many fragrance sprays, aromatherapy blends, and household cleaning products. Juniper berry essential oil is commonly used for sore throats and respiratory infections. Research shows that juniper berry essential oil contains more than 87 active ingredients including antifungal, antioxidant, antibacterial, and antimicrobial agents. A 2003 study published in the journal Phytotherapy Research (8) found that the antimicrobial activity of juniper oil is likely due to a combination of compounds called beta-pinene, p-Cymene, and alpha-pinene. 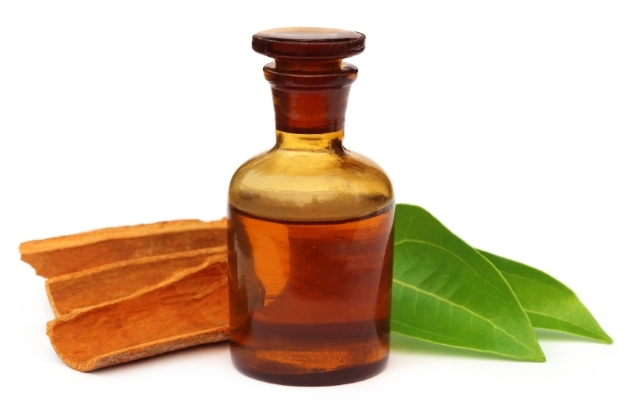 Clove oil exhibits antimicrobial activity against a number of multi-resistant bacteria. Clove oil is an essential oil used to boost the immune system and relieve sore throats, due to its antiviral, anti-inflammatory, stimulating, antiseptic, antifungal, and antimicrobial properties. 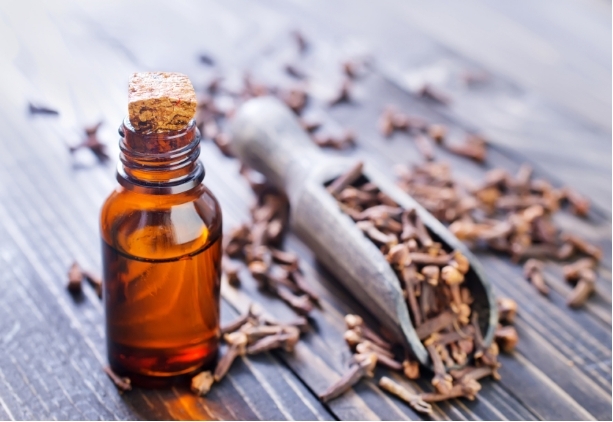 A study published in the journal Phytotherapy Research in 2007 (9) found that clove oil exhibits antimicrobial activity against a number of multi-resistant bacteria. When you have a sore throat or cough, it’s a good idea to chew on a clove bud. Research shows that camphene, a component in cypress oil, inhibited the growth of nine different bacteria. 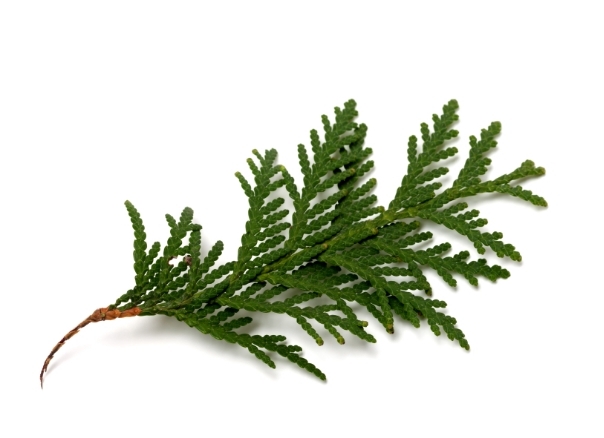 Cypress essential oil is highly valued for its ability to aid the respiratory system and fight infections. Cypress oil can clear congestion and eliminate phlegm buildup in the lungs and respiratory tract. 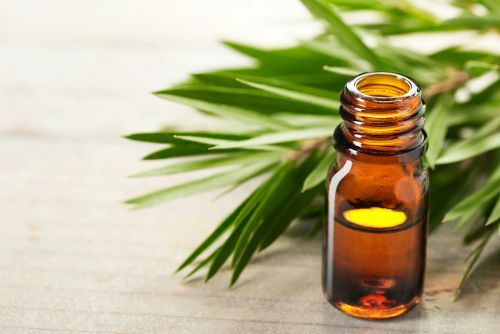 The antispasmodic properties in cypress oil can treat respiratory ailments such as coughing and congestion due to colds, bronchitis, and asthma. A study published in the Journal of Agricultural and Food Chemistry in 2004 (10) found that camphene, a component in cypress oil, inhibited the growth of nine different bacteria. The antiseptic properties of hyssop oil are also thought to help fight against bacteria and infections. In ancient Greece, Hippocrates valued hyssop essential oil for inflammation of the chest and throat, and other bronchial problems. The antiseptic properties of hyssop oil are also thought to help fight against bacteria and infections. Hyssop is considered a good choice for lung inflammation, and bacterial or viral throat infections. Basil leaves. To reduce coughing and congestion from allergies, simply add a drop of basil oil into soups or salad dressings. Basil is an essential oil known to decrease inflammation from allergies, and it works by detoxifying the body from viruses and bacteria. A study published in the journal Letters of Applied Microbiology in 1998 (11) found that five varieties of sweet basil oil showed potent antimicrobial activity against most of the bacteria examined. To reduce coughing and congestion from allergies, simply add a drop of basil oil into soups or salad dressings. You can also support the respiratory system by diluting two to three drops of basil oil in equal parts of coconut oil, and then applying that mixture topically to your temples, chest, and the back of the neck. 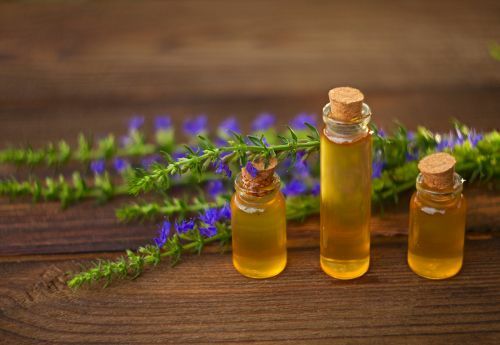 Rosemary oil is effective against drug-resistant strains of bacteria. Rosemary essential oil is known to relieve respiratory disorders such as whopping cough, asthma, sinus infections, and bronchitis. This makes rosemary one of the better essential oils to diffuse for coughs, congestion, and colds. A study published in the journal Molecules in 2013 (12) found that rosemary oil is effective against drug-resistant strains of bacteria. Here are 12 ways to use essential oils to help relieve coughs, colds, and congestion. Aromatherapy is an effective practice to relieve coughing. Simply add a few drops of the desired essential oil into a diffuser. Diffusers are a sure fire way to use the aforementioned essential oils for coughs explained in this article. A high-quality diffuser is definitely worth the investment! The diffuser will break down the essential oils into tiny molecules, which spread into the air. Overall, this process will improve the quality of the air in the room. This is perfect for fighting everything from colds and congestion, to sinus infections and the flu. For an essential oil tissue aid formula for congestion, simply add six drops of eucalyptus oil and four drops of lavender oil onto different parts of several tissues. Then, put them into a zip lock bag. Hold a tissue to your nose and breathe in whenever congestion relief is needed. Many people also prefer essential oils for topical use. In this process, the oil is applied to the skin, hair, nails, teeth, or mouth. However, due to their high potency, it’s important to dilute and blend your essential oils with carrier oils such as jojoba, avocado, coconut, or sweet almond. The mixture can then be applied to the affected area. This homemade balm is not only great for coughs and congestion, but it is also useful for relaxation. The following recipe contains essential oils and other natural ingredients, which have antibacterial, antiviral, and sedative properties. Place all the oils in a large mason jar. Rub a teaspoon of the balm on your chest before bed. Add tea tree oil and thyme oil to your warm bath. Be sure not to exceed two drops of thyme due to possible irritation. At the same time, do not exceed eight drops of essential oil in total. This homemade vapor rub can help soothe the throat and improve breathing. It contains essential oils and other natural ingredients. Here is an easy-to-follow recipe. Place all the oils and beeswax in a large mason jar. Put two inches of water in a saucepan over medium to low heat. Place the jar in the saucepan and allow the oils to melt, and stir to combine the oils. After they have combined, cool the mixture, and add the essential oils. Pour the mixture into metal tins, or store in containers. Allow the mixture to set. Use on your chest for congestion and cough relief. Many essential oils can also be ingested by mouth, but the oils must be safe and pure. 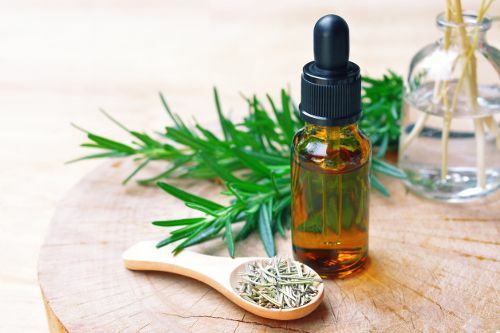 The Food and Drug Administration has approved certain essential oils for internal use with the generic designation for human consumption known as GRAS (generally recognized as safe). Some companies also sell high-quality essential oils for coughs. A drop of essential oil can be added to a glass of water or tea, or a teaspoon of honey. You can also add a drop or two under the tongue, into a capsule, or into your favorite meal. Place sea salt, tea tree oil, and ravensara oil into a glass of warm water, and stir the mixture vigorously. Sip a small amount of the mixture, gargle for 30 seconds, and spit. Gargle several times, and continuously stir mixture before each gargle. It is best to use this treatment every four hours. Combine three tablespoons of honey with two drops each of eucalyptus oil and lemon oil. Add a teaspoon of the mixture to warm water in a glass. Drink slowly. Combine coconut oil and essential oils. Boil two cups of water, infuse with herbs, and let steep for about 20 minutes. Pour infused mixture and honey into a medium-sized saucepan, and turn to medium heat. Stir the mixture until it reaches 300 degrees Fahrenheit. It will take about 30 minutes. Test it by dropping some in ice water to see if it hardens. Mix in coconut oil and essential oils and pour into candy molds, or pour onto a large baking sheet greased with coconut oil. Let cool and mold into lozenges with your hands. Put the finished lozenges on parchment paper to cool. Once cool, toss in stevia and powdered slippery elm mixture to keep from getting sticky. Use as needed for sore throats, congestion, or coughing. There are natural ways to use essential oils for cough, cold, and congestion relief. Conventional cough syrups often contain lots of sugar. As an alternative, try a homemade cough syrup that will naturally boost the immune system and soothe your throat. It doesn’t take long to make, and all it requires are a few essential oils and some honey. Below is a simple recipe. Place the honey in a jar, and add the essential oils. The right essential oils for coughs, colds, and congestion can be a great addition to any treatment program. But that said, it’s always critical to understand how to use essential oils. Pregnant women, children, infants, seniors, and those with severe illnesses should consult with a specialist before using essential oils. It’s best to never ingest essential oils or apply undiluted oils to the skin without the training or supervision of a medical professional. For instance, tea tree oil should not be taken internally; it’s best suited for aromatherapy or topical use. Any essential oil should always be diluted with carrier oil. If taking essential oils internally, it’s better to consume one to two drops daily for a month and then taking a two-week break before continuing treatment. Coughs, colds, and congestion spell disaster. The good thing is, essential oils play a big part in fighting these problems. The active compounds found within could work as anti-inflammatory, antibacterial, antiviral, and sedative agents, among other health benefits. What essential oils will you have on hand when a nasty cold with a cough and congestion hits? As a takeaway, remember the key essential oils featured in this article: lemon, frankincense, lavender, peppermint, tea tree, oregano, eucalyptus, thyme, juniper berry, clove, cypress, thieves, hyssop, basil, rosemary essential oils. Basically, you can’t go wrong with any of these essential oils for coughs, colds, and congestion. Also, be sure to make use of the many recipes and uses featured in this article, including vapor rub, massage oils, hot baths, lozenges, and even cough syrups.